But where do they get the money to make these loans? You guessed it: Wells Fargo, Citibank, Bank of America and everyone else who got their hands dirty ten years ago. Behold the Subprime Work-Around! According to the Wall Street Journal, loans to non-bank financial firms increased six-fold from 2010-2017, hitting a record $345 billion. Wells Fargo coughed up $81 billion; Citigroup and Bank of America ponied up $30 billion each; and JP Morgan threw in another $28 billion. An astonishing 6 out of 10 Mortgage lenders in the U.S. are now shadow banks – many operating online and peddling subprime loans. It was precisely this type of non-transparent, under the radar, backdoor lending that led to the soaring foreclosures, cratering home values, failing banks and dwindling retirement accounts of a decade ago. And early next year, Fair Isaac and Company, the creator of the FICO score, is launching a new opt-in program that will enable consumers to enhance their credit scores by using checking and savings account data. Astonishingly – a decade after subprime lending crashed the housing and financial markets – the new ultraFICO score will boost loan approvals to those who were previously considered subpar borrowers. The Wall Street Journal reports that “some 26 million subprime borrowers will end up with higher credit scores.” So those who were previously deemed financially irresponsible will soon have much greater access to credit. If the prospect of another subprime debacle that could bankrupt tens of millions of folks is not motivation enough to finally get away from big banks, then what is? Loan Depot, PennyMac, Freedom Mortgage, Caliber Home Loans – you’ve heard their names. By using non-banks and secret backchannels between their money and risky borrowers, the big banks and fat cat investment houses have again put you in jeopardy! This time won’t be different! Don’t become a victim of greedy lenders and those who borrow beyond their means. The Bank On Yourself safe wealth-building strategy is the ideal financial bunker for scary times. It helped millions of people survive the financial crises of the last 160 years… just as it will protect them from the next housing crisis, market crash, banking collapse and economic downturn. The Bank On Yourself Strategy Provides You These Advantages… Which Ones Are Most Important to You? You owe it to yourself to find out how the Bank On Yourself strategy can give you the financial peace of mind you want and deserve. 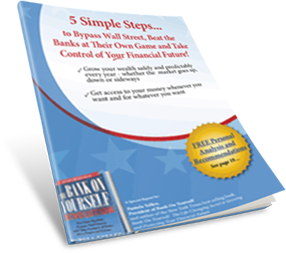 Request a free, no-obligation Analysis here to take the next step to Bank On Yourself. Don’t trust the bailout bandits again – Bank On Yourself this time!